All of the above documents pose a risk to you and your family if they are picked up by the wrong person because even the smallest amount of personal information is all a criminal needs to steal identities. Your best bet is to scan in the ones you may need in the future and shred them. Many of us store tons of personal information on our devices—and when it’s time to upgrade or the information (as on hard drives and thumb drives) becomes outdated, mistakenly believe that we can just delete info and toss them in the recycling bin. But be warned, cell phones, tablets, hard drives and thumb drives can be hacked, even after you’ve wiped them clean. To the layman, the memory and all your data may appear to be deleted, but hackers know how to access information that is invisible to you. Unless you plan to give your old devices to a trusted family member (and even in this case you should delete all personal files), it’s recommended that you have them professional destroyed (shredded). As you begin Spring Cleaning and de-cluttering your home and office, make sure you’re prudent when it comes to recycling and throwing into trash bins. Follow these tips for safeguarding your confidential information against ID thieves to protect yourself and your family. All Points Mobile Shredding offers commercial and residential shredding and hard drive destruction services at your home or office. 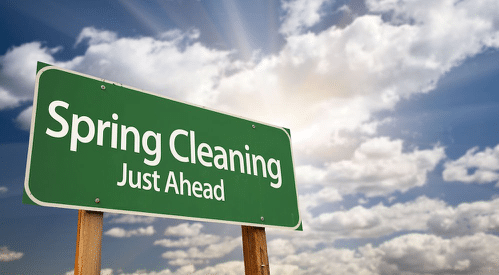 We’re a family owned and operated business that is dedicated to serving you and our community, give us a call today at 772.283.4152 to schedule your spring cleaning shredding! ← Corporate Identity Theft: Are you at risk?